Here’s my progression through the painting of this week’s Mandala of the Week #34: A Rose is a Rose. I used a set of Pelikan watercolors and a set of Yasutomo Pearlescent watercolors. This painting is the first time I’ve used the pearlescent watercolors…was eager to play with them. When working with sets of colors, I find it helpful to make a chart for each set so that I can see what all the colors look like. 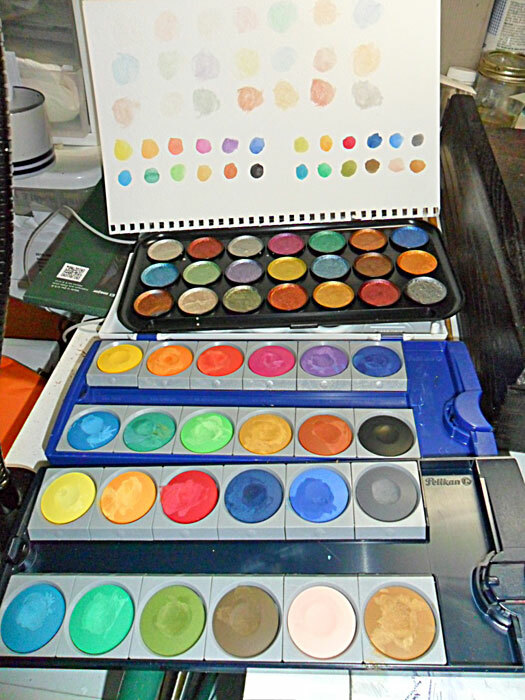 Then when I have a certain color in mind, I can look at my chart to find the color that best matches; then I know which paint color to use from the set. Select an image to see a larger view or go through the slide show.